I recently finished reading a very controversial book called Race Differences in Intelligence by Richard Lynn. The structure of the book can be broken down into two main parts. The first part is a survey of a wide variety of academic literature that shows that there are differences in the IQs of different races. The second part is where the author presents his arguments on why there is reason to believe that these differences are partly determined by genetics, and why this happened. The author claims the variation of IQ observed between the different races is due to the various climates in which different groups had to survive. In essence, his argument is the following: since colder climates are more difficult to survive in, groups living in those areas eventually developed higher IQs. The following table lists the races ranked in ascending order of their intelligence levels, and gives their geographical location and their median IQs. It is a principle of evolutionary biology that when sub-populations of a species become geographically isolated and occupy different environments, they become genetically differentiated and eventually diverge so much that they become different species. It is in accordance with this principle that the races have become genetically differentiated for all characteristics for which there is genetic variation, including body shape; color of skin, hair, and eyes; prevalence of genetic diseases; and blood groups. It is inconceivable that intelligence would be the single exception to these differences. Some racial differences in intelligence must also have evolved as a matter of general biological principle. 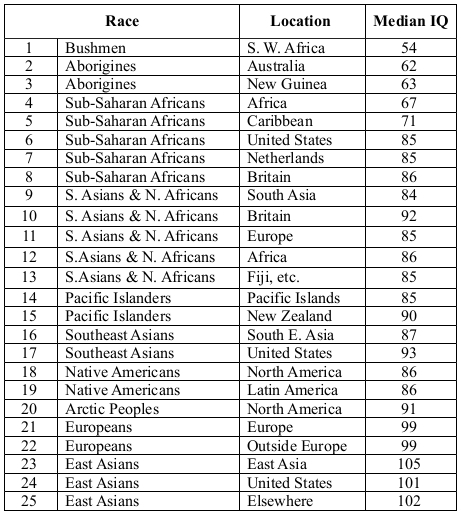 The studies summarized in the table show a consistency of the IQs of the races in a wide range of geographical locations that can only be explained by some genetic determination. The races differ consistently in IQ when they live in the same environments. Thus, Africans in the United States, Britain, the Netherlands, and Brazil consistently have lower IQs than whites. When babies from other races are adopted by Europeans in Europe and the United States, they retain the IQs characteristic of their race. Mixed-race individuals have IQs intermediate between those of the two parent races. Thus, in the Weinberg, Scarr, and Waldman (1992) study of children adopted by white middle class families, at the age of 17 years blacks had an IQ of 89, those of mixed black-white parentage an IQ of 98, and whites an IQ of 106 (Lynn, 1994c). When the amount of European ancestry in American blacks is assessed by skin color, dark-skinned blacks have an IQ of 85 and light-skinned blacks have an IQ of 92 (Lynn, 2002a), and there is a statistically significant association between light skin and intelligence. The IQs of races explain the extent to which they made the Neolithic transition from hunter gathering to settled agriculture. This transition was made completely by the more intelligent races: the Europeans, the South Asians and North Africans, the East Asians, the South-east Asians, and the Native Americans; to some extent by the Pacific Islanders, who were handicapped by living in small and dispersed populations on small islands; minimally by the Africans; but not at all by the Bushmen and Australian Aborigines, with IQs of 54 and 62, who have made virtually no progress in the transition from hunter-gatherers to settled agricultural societies. The only anomaly is the Arctic Peoples, with their IQ of 91, who remain largely hunter-gatherers, but this is due to their very small and dispersed populations and the harsh climate of the Arctic Circle. The IQs of races are consistent with their achievements in the development of early urban civilizations with written languages, systems of arithmetic, and codified laws as shown by Baker (1974), who has documented that only the East Asians, the Europeans, the South Asians and North Africans, and the Southeast Asians developed early civilizations. All the twin studies that have been carried out in Europe, India, and Japan, and on blacks and whites in the United States, have found a high heritability of intelligence in national populations. It is improbable that these high heritabilities within races could co-exist with the absence of any heritability for the differences between the races. There are race differences in brain size that are associated with differences in intelligence, and brain size has a heritability of 90 percent (Baare, Pol et al., 2001) (see also Rushton and Osborne, 1995). The only reasonable interpretation of this association is that the races with the higher intelligence have evolved larger brains to accommodate their higher IQs. The consistency of all the racial differences in so many different nations, in the development of early and later civilizations, and the high heritability of intelligence wherever it has been investigated, all need to be considered in terms of Popper's (1959) theory of the logic of scientific explanation. This states that a scientific theory generates predictions that are subjected to empirical testing. A strong theory has few assumptions and generates a large number of predictions that are empirically verified. If the predictions are discontinued the theory is weakened and may even be destroyed, although a single disconfirmation can generally be explained or the theory can be modified to account for it. For the problem of race differences in intelligence, the theory that these have some genetic basis explains all the numerous phenomena set out in the points listed above, and there are no serious anomalies. The theory that the race differences in intelligence are to a significant extent genetically based fulfills Popper's criteria for a strong theory. Those who assert that there is no evidence for a genetic basis of racial differences in intelligence betray a lack of understanding of the logic of scientific explanation. Needless to say, I'm quite irritated by this book. First, I don't want to believe that certain races are simply more intelligent than others. Being born and raised in America, I have adopted the racial sensitivity that has made me highly suspicious of any claims of racial superiority. That said, what I want to believe is completely different than what is true, and so if we only consider Lynn's arguments, I have to say that they seem to be quite reasonable. Assuming that his facts are correct, I can't think of any fatal flaws to his logic. However, the second reason why I'm irritated by his work (which is my academic criticism) is that the author adopts IQ as the sole measure of intelligence. I can accept the fact that certain races have higher IQs and perhaps that these variations are partly genetically determined, but I don't accept that we can truly measure intelligence using an IQ test. An alternative to equating IQ to intelligence is the theory of Multiple Intelligences (MI), which I have found to be much more reflective of the capacities of human beings. Howard Gardner, the main proponent of MI theory, argues that all non-disabled human beings are born with the following intelligences: musical, bodily-kinesthetic, logical-mathematical, linguistic, spatial, interpersonal, intrapersonal, naturalist, and existential. Until advocates of race differences in intelligence incorporate MI theory and show that their conclusions still hold true, I don't accept the claim that certain races are more "intelligent" than others. Although I can see why many Republicans think this, saying that more and more people are being lazy ignores the legitimate ideology of the Left. I'm sure that there are many people who are lazy and who really do just want “stuff” from the government, but that's not what justifies redistributive policies. It would be the same if I were to say that Republicans want to lower taxes because they're selfish. Again, I'm sure this is true for many of them, but that's not what justifies lower taxation. The honest debate that should be taking place is the one between “equality of opportunity” and “the right to one's property,” which, respectively, are the philosophical justifications that underlie much of left-wing and right-wing policies. Supporters of equality of opportunity would argue that the government has a role to play in leveling the playing field when it comes to living a flourishing human life. It is simply a fact that there is a large difference between the life chances of a person born into a poor family and those of someone born into a rich family. And since the discussion of socio-economic status cannot really be detached from the issue of race, the statement can reasonably be rephrased as the following: life is much more difficult for a black person than a white person. How can this be fair? Why should people suffer from a bad draw of the natural lottery if something can be done about it? They shouldn't, according to a supporter of equality of opportunity. In light of this reasoning, some redistribution of resources must take place and this unfortunately requires “taking” from the rich and “giving” it to the poor in some form or another. “But this is theft!” some would say on the right. “I earned my money by working hard and therefore, it belongs to me. By taking it away and giving it to others, it infringes on my rights.” There is validity in this argument. As the famous philosopher Robert Nozick pointed out, taxation is comparable to forced labor. If the government has a claim on a portion of one's income, it is equivalent to the government having a claim on a certain amount of hours of one's labor. This would be an unacceptable infringement on the right to one's property and to one's self, claimed Nozick. Take the example of an accomplished athlete, Michael Jordan. This person has a specific set of skills that are highly demanded by the public. Accordingly, millions of people are willing to buy tickets to see him play basketball and so over a period of time, he becomes very rich. Can we truly say that his fortune doesn't belong to him? This is the philosophical debate that we should be having in our public discussions, but instead, political commentators resort to petty attacks on character, which ultimately ignore the legitimate ideologies of both the Left and Right. If we sincerely want the better argument to win in the end, it must be done through the correct way by first recognizing that the beliefs of the other side are justifiable. Doing this may be difficult and so we might be tempted to just brainwash people into hating the other side, but it wouldn't be the right thing to do. The woman who shares my grandma's room at the nursing home is in a coma and has been for quite a long time. Everyday when I visit my grandma, I see the woman's husband there reading bible passages to her. One day I even saw the husband asleep in a chair while holding his wife's hand. Seeing this manifestation of love and dedication touched my heart and it made me realize that I am simultaneously sorry for and envious of the husband. On the one hand, I feel so bad for the man because it must be horrible to have your loved one in a such a condition, but on the other hand, I am extremely envious of the love that he has experienced in his life. Someone once asked Noam Chomsky what love was and he responded by saying that he had no idea, but that life was empty without it. I have personally never fallen in love so I do not know if that is true or not, but I suspect that he is correct and that love is a crucial component of what it means to be human. This is not to say that it will only bring happiness—in fact, it often brings pain and suffering, as witnessed by the husband mentioned above—but it does mean that one will have a richer life. In light of this, I have realized that I highly desire to fall in love. This has not always been the case, however. Indeed, just a few years ago love did not occupy any of my thoughts. Of course I thought about women, but it was not the same as how I think about them now. In the past, I never truly considered devoting myself to someone for the rest of my life. I never appreciated the idea of having a partner who would always stay by your side. And now, since my stance on love has developed, relationships based on anything less than true love seem to be quite pathetic. I once watched a news special about a website that aimed to set up rich men with pretty women. (It was practically prostitution but was not illegal because it could not be proven that sexual services were traded for money.) In this special, they interviewed a number of people who used the site including a rich man who owned some production company in Hollywood. To be honest, the man seemed to be quite happy with his life. He had the money and he had the beautiful women. Moreover, he seemed to be perfectly accepting that his relationships were contingent on the fact that he was wealthy. The question I asked myself after watching this report was this: “Would anyone who has experienced true love ever deem relationships based on money to be as meaningful?” My suspicion is no. I suspect that if that rich man actually fell in love, he would realize that all his previous relationships were "less than." But who knows? Perhaps there are people out there would find monetary relationships to be more fulfilling. I cannot say for certain. However, I am quite convinced that in the end, I personally would rather be the husband reading bible passages to my sick wife than the millionaire with his beautiful women.